Coaching with Horses Offers Great Benefits for Employees | HPM Associates, Inc.
Do you want to encourage your employees to work together more effectively and help motivate them like never before? There are several different team-building exercises that you can try. But you’re not going to find many that work as well as Coaching With Horses does. Coaching with Horses calls on people to work together to complete a series of tasks alongside horses. It often challenges them in new ways and leads to real results. Horses don’t typically respond to verbal commands. As a result, people cannot simply tell horses what to do and get results. 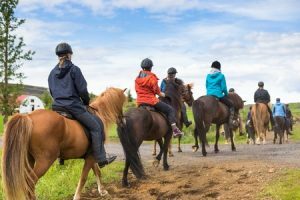 Instead, they need to communicate with one another and work together to solve problems related to horses during Coaching with Horses team-building exercises. This forces people to step outside of their comfort zone and take innovative approaches to situations involving problem-solving. You can tell your employees the areas in which they need to improve through regular evaluations. But wouldn’t it be better for them to identify their own shortcomings and find ways to make improvements? When working with horses, people will gain a self-awareness that they wouldn’t have otherwise. They’ll see the things they need to work on for themselves so that they can start to work on them without anyone else having to say a word. Motivating a horse and getting it to move around is a tall task. It requires a lot of hard work, creativity, and collaboration. Once your employees are able to motivate a horse to move, they’ll feel like they can do just about anything together. You’ll notice a change in the way they collaborate and work together when trying to hit a common goal. Would you like to see how Coaching with Horses might benefit your employees and your company as a whole? Call HPM Associates at 305-274-0030 today to learn about the team-building opportunities that we can provide for you.